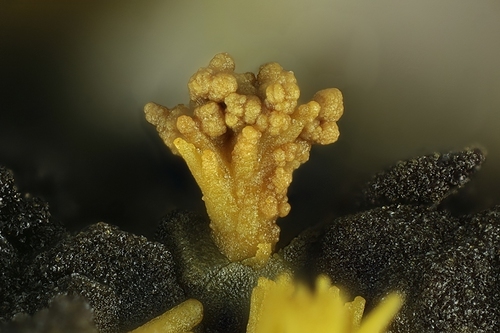 Plumbojarosite: Mineral information, data and localities. Named in 1902 for its composition with dominant lead (Latin = PLUMBum) and its relationship to JAROSITE. Found as golden brown to dark brown crusts or masses composed of microscopic hexagonal plates; rarely as small crystals of variable morphologies (in slags blackish crystals often occur). May also be powdery, earthy, or ochreous. May be confused with jarosite, natrojarosite, beudantite, corkite, beaverite-(Cu) and other members of the Alunite Supergroup. It forms solid-solution series with all of these. crusts, lumps or compact masses composed of microscopic hexagonal plates; may be pulverant, earthy, or ocherous. The presence of Pb2+ results in the "c" axis of the hexagonal cell being doubled in comparison to jarosite, with half the Pb sites vacant in an orderly arrangement; and this also results in other minor compensating differences from the jarosite structure. Gypsum 7 photos of Plumbojarosite associated with Gypsum on mindat.org. Minium 4 photos of Plumbojarosite associated with Minium on mindat.org. Cuprite 4 photos of Plumbojarosite associated with Cuprite on mindat.org. Plumbogummite 3 photos of Plumbojarosite associated with Plumbogummite on mindat.org. Goethite 2 photos of Plumbojarosite associated with Goethite on mindat.org. Beaverite-(Cu) 2 photos of Plumbojarosite associated with Beaverite-(Cu) on mindat.org. Corkite 2 photos of Plumbojarosite associated with Corkite on mindat.org. Pyrolusite 2 photos of Plumbojarosite associated with Pyrolusite on mindat.org. Libethenite 2 photos of Plumbojarosite associated with Libethenite on mindat.org. Chukhrovite-(Ca) 2 photos of Plumbojarosite associated with Chukhrovite-(Ca) on mindat.org. 7.BC.40 Piypite K4Cu4O2(SO4)4 · (Na,Cu)Cl Tet. 25.7.2 Zircosulfate (Zr,Ti)(SO4)2 · 4H2O Orth. Very slowly soluble in acids. Hillebrand and Penfield (1902) American Journal of Science: 14: 211. Hillebrand and Wright (1910) American Journal of Science: 30: 191. Butler and Schaller (1911) American Journal of Science: 32: 422. Knopf (1915) Journal of the Washington Academy of Sciences: 5: 497 (as Vegasite). Larsen, E.S. (1921) The Microscopic Determination of the Nonopaque Minerals, First edition, USGS Bulletin 679: 121. Hendricks (1937) American Mineralogist: 22: 773. Palache, C., Berman, H., & Frondel, C. (1951), The System of Mineralogy of James Dwight Dana and Edward Salisbury Dana, Yale University 1837-1892, Volume II. John Wiley and Sons, Inc., New York, 7th edition, revised and enlarged, 1124 pp. : 568-570. Mumme, W. and Scott, T. (1966): The relationships between basic ferric sulfate and plumbojarosite. Am. Mineral. 51, 443-453. Canadian Mineralogist (1985): 23: 659-668. Gaines, Richard V., H. Catherine, W. Skinner, Eugene E. Foord, Brian Mason, Abraham Rosenzweig (1997), Dana's New Mineralogy : The System of Mineralogy of James Dwight Dana and Edward Salisbury Dana: 635. Mills, S. J., Madsen, I. C., Grey, I. E. & Birch, W. D. (2009) In situ XRD study of the thermal decomposition of arsenian plumbojarosite. Canadian Mineralogist, 47(3), 683–696. Basciano, L. C. & Peterson, R. C. (2010): A crystallographic study of the incomplete solid solution betweeen plumbojarosite and jarosite. Can. Mineral. 48, 651-659. Madsen, I. C., Grey, I. E. & Mills, S. J. (2010): In situ diffraction studies: Thermal decomposition of a natural plumbojarosite and the development of Rietveld-based data analysis techniques. Materials Science Forum, 651, 37-64. B. G. Lottermoser: P. M. Ashley, M. Muller and B. D. Whistler (1997) Metal contamination at the abandoned Halls Peak massive sulfide deposits, New South Wales. Tectonics and Metallogenesis o/the New England Orogen. Geological Society of Australia Special Publication 19, 290-299. Graham, I. T., Pogson, R., Colchester, D. M. and McKinnon, A. R. (2005): Secondary minerals of the Mineral Hill field. Australian Journal of Mineralogy, 11, 101-116. Geochemical, mineralogical and biogeochemical characterisation of abandoned metalliferous mine sites, Southern New England Orogen. In Flood P.G (ed.) Regional Geology, tectonics and metallogenesis, New England Orogen 1-3 Forum, 1999, Department of Earth Science U.N.E. Australia. ; B. G. Lottermoser: P. M. Ashley, M. Muller and B. D. Whistler (1997) Metal contamination at the abandoned Halls Peak massive sulfide deposits, New South Wales. Tectonics and Metallogenesis o/the New England Orogen. Geological Society of Australia Special Publication 19, 290-299. Raymond, O. L. (1992). Mt Isa Inlier and environs mineral deposit database version 1.0. Australian Geological Survey Organisation Record, 66. Kolitsch, U. and Elliott, P. (1999): Mineralogy of the Mount Malvern Mine near Clarendon, South Australia. Australian J. Mineral. 5, 3-17. Awid-Pascual, R., Kamenetsky, V. S., Goemann, K., Allen, N., Noble, T. L., Lottermoser, B. G., & Rodemann, T. (2015). The evolution of authigenic Zn–Pb–Fe-bearing phases in the Grieves Siding peat, western Tasmania. Contributions to Mineralogy and Petrology, 170(2), 1-16. Simpson, E.S. (1938) Journal of the Royal Society Western Australia, vol. 240, p. 110.; Kingsbury, A.W.G. and Hartley, J. (1960) Carminite and beudantite from the northern part of the Lake District and from Cornwall. Mineralogical Magazine, vol. 32, n° 249, 423-432. (referring to Simpson 1938). ; Ferguson, K.M. (1999) Lead, Zinc and Silver Deposits of Western Australia. Geological Survey of Western Australia, Mineral Resources Bulletin 15. Nickel, E. H., & Hitchen, G. J. (1994). 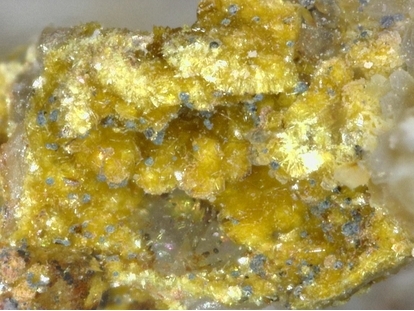 The phosphate analog of molybdofornacite from Whim Creek, Western Australia. 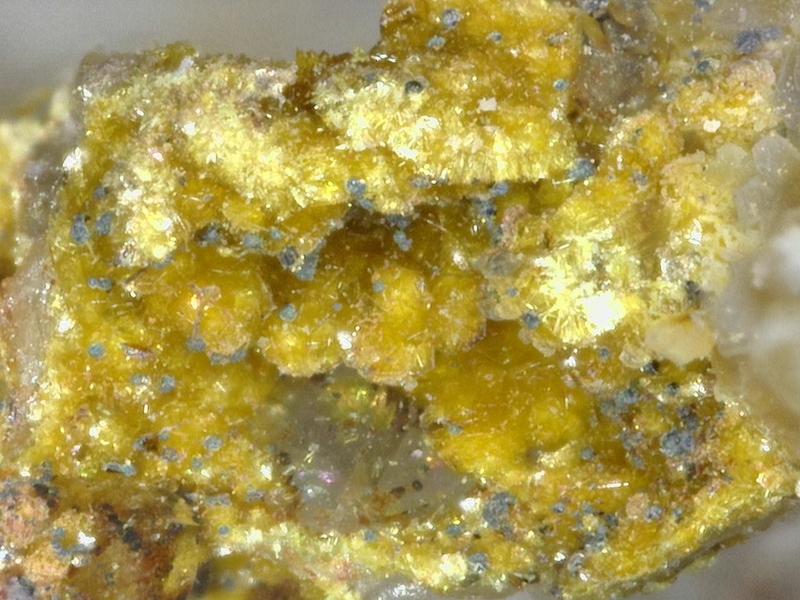 Mineralogical Record, 25(3), 203. Auer, C. & Kolitsch, U. (2017): Die Mineralien des Emmastollens im Ratteingraben bei Waitschach, Kärnten. Der Steirische Mineralog, 32, 11-21. Blaß, G., Graf, H.-W. & Pichler, A. (1997): Sekundäre Neubildungen in Schlacken von St. Martin am Silberberg in Kärnten (2). 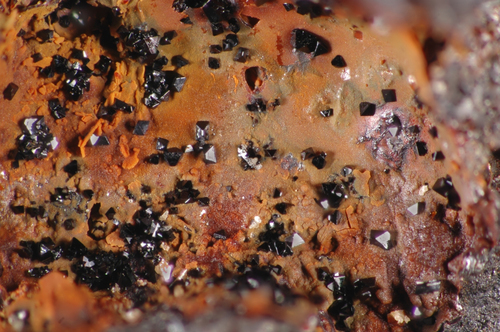 Mineralien-Welt, 8(6), 54-55. Blass, G. & Graf, H.-W. (2001): 1255. Plumbojarosit, Schwefel, unbekannte Wismut-Sekundärphasen sowie Aschamalmit, Gersdorffit und ein nicht eindeutig bestimmtes Wismuterz von der Feldsee Scharte im Wurtengebiet, Hohe Tauern, Kärnten. Pp. 158-159 in: NIEDERMAYR, G., F. BERNHARD, G. BLASS, H.-P. BOJAR, F. BRANDSTÄTTER, K. ETTINGER, H.-W. GRAF, V. M. F. HAMMER, B. LEIKAUF, H. MEDITZ, B. MOSER, W. POSTL, J. TAUCHER & P. TOMAZIC (2001): Neue Mineralfunde aus Österreich L. – Carinthia II, 191./111. : 141-185. Kolitsch, U., Bernhardt, F., Brandstätter, F. & Schachinger, T. (2010): 1658) Arsenopyrit, Bariopharmakosiderit, Baryt, Covellin, Jarosit, Karminit?, Mawbyit?, Mimetesit, Philipsbornit, Plumbojarosit, Pyrit, Pyromorphit, Schwefel, Segnitit, Sphalerit und Wulfenit vom Sperkerriegel bei Wiesmath, Bucklige Welt. Pp. 243-245 in Niedermayr et al. (2010): Neue Mineralfunde aus Österreich LIX. Carinthia II, 200./120., 199-260. Kolitsch, U. (2013): 1815) Corkit und Plumbojarosit vom Arzberg bei Kottaun bei Geras, Waldviertel, Niederösterreich Pp. 128-129 in In Niedermayr, G. et al. (2013): Neue Mineralfunde aus Österreich LXII. Carinthia II, 203./123., 91-146. Paar, W. & Postl, W. (1993): 919. Cosalit, Anglesit, Plumbojarosit und Bismutit (?) aus dem Bereich des Silberpfennigs, Gasteiner Tal, Salzburg. P. 279-280 in NIEDERMAYR, G., F. BRANDSTÄTTER, B. MOSER, W. H. PAAR, W. POSTL, J. TAUCHER & H.-P. BOJAR (1993): Neue Mineralfunde aus Österreich XIIL. Carinthia II, 183./103. : 265-290. Leikauf, B., Bojar, H.-P., Taucher, J., Kolitsch, U. & Brandstätter, F. (2013): 1826) Caledonit, Linarit, Mimetesit, Munakatait, Plumbojarosit und vermutlich Oxyplumboroméit aus dem Kupfervorkommen der Wolfgruben bei Seiz, Liesing-Paltental, Steiermark. Pp. 138-139 in Niedermayr, G. et al. (2013): Neue Mineralfunde aus Österreich LXII. Carinthia II, 203./123., 91-146. Schachinger, T., Bernhard, F. & Auer, Ch. (2015): 1950) Anglesit, Beudantit, Gips, Mimetesit, Plumbojarosit, Schultenit, Skorodit, Symplesit/Parasymplesit und Wulfenit sowie andere Mineralien von einer Bergbauhalde nordwestlich des Rossecks, St. Blasen bei Murau, Steiermark. Pp. 264-265 in Niedermayr, G. et al. (2015): Neue Mineralfunde aus Österreich LXIV. Carinthia II, 205./125., 207-280. Kolitsch, U. (2013): 1824) Plumbojarosit, Wroewolfeit und die Phase Ca[Zn8(SO4)2(OH)12Cl2](H2O)9 aus den Schlacken der Walchen bei Öblarn, Niedere Tauern, Steiermark. Pp. 133-134 in Niedermayr, G. et al. (2013): Neue Mineralfunde aus Österreich LXII. Carinthia II, 203./123., 91-146.
ⓘ Bleyberg zinc and lead smelter slag locality ? Palache, C., Berman, H., & Frondel, C. (1951), The System of Mineralogy of James Dwight Dana and Edward Salisbury Dana, Yale University 1837-1892, Volume II: 569. Bulgarian Academy of Sciences Annual Report No. 13, 43-45. Saric N. et altri (1971); "Apuntes sobre algunas minas de la región costera de Antofagasta"; IIG, Stgo de Chile. Valdes-Nodarse, E.L. (1998): Mineralium Deposita 33, 560-567. Romero, F. M. et al. (2010): Applied Geochem. 25, 716-727. Pauliš P., Kopecký S., Jebavá I.: Nové nálezy supergenní mineralizace v havlíčkobrodském rudním revíru (Česká republika). Bulletin mineralogicko-petrografického oddělení Národního muzea v Praze, 2011, 19, 1, 76-82. Huhta, P. 1989. Moreenin raskasmineraalit malminetsijän apuna. Geologi 41, 56-60. Chollet, P. & Devouard, B. (2013): La mine de cuivre et de plomb des Rats, Le Crozet (Loire). Le Règne Minéral, 109, 7-46. Chauris, L. (2014): Minéraux de Bretagne, Les Editions du Piat, 162. Reinhardt, M. & Henrich, M. (2016): Die Grube Friedericke bei Siegen: Fundort schöner Blei- und Kupfermineralien. Mineralien-Welt, 27 (1), 26-31. Hucko, S. (2010): Phosphatparagenesen auf Brauneisensteingängen am Windhahn. Mineralien-Welt 21 (2), 14-25. Schnorrer-Köhler, G. (1986): Neufunde in den Schlacken von Laurion. Lapis, 11 (6), 25-29; 42. Szakáll: Minerals of Rudabánya, 2001; Sánoor Szakáll, Mária Foldvári, Gábor Papp, Péter Kovács-pálffy, Árpád Kovács (1997) Secondary Sulphate Minerals From Hungary. Acta Mineralogica-petrographica, Szeged, Xxxviii, Supplementum, 7-63. Szakáll, Á., Fölvári, M., Papp, G., Kovács-Pálffy, P., Kovács, A. (1996) Secondary sulphate minerals from Hungary. ACTA Mineralogica-Petrographica, Tomus XXXVIII, Supplementum, Szeged, Hungary, 7-63. Boni, M. et al. (2007): Hypogene Zn carbonate ores in the Angouran deposit, NW Iran. Mineralium Deposita 42, 799-820. - Bortolozzi G.M., Pondrelli M. e Vidus L. (2015) : I minerali della Creta di Timau (Lago Avostanis, Paluzza, Udine): riscoperta di un’antica località mineraria. Gortania, 37, 15-31. Stara, P., Rizzo, R., Tanca, G.A. [with contributions of Vinci, A., Astolfi, M.] (1996): Iglesiente e Arburese. Miniere e Minerali. Associazione Mineralogica Sarda, Associazione Mineralogica Domusnovas, Gruppo Mineralogico Arburese, Gruppo Mineralogico Paleontologico Piacentino, Gruppo Mineralogico Lombardo et al. Ed., Siena, Vol. 2, 192 pp. Christophe Boutry collection; Jansen, H. & van den Berg, W. (1998): Slakkenmineralen in Toscane (Italië). Gea, no. 4, 109-117 (in Dutch). Franzini, M., Perchiazzi, N. (1992): I minerali delle scorie ferrifere etrusche di Baratti (Livorno). Atti della Società Toscana di Scienze Naturali, Memorie, Serie A, 99, 43-77; Franzini, M., Perchiazzi, N., Bartoli, M.L., Chiappino, L. (1992): Baratti (LI): una nuova località mineralogica italiana analoga al Laurion. Rivista Mineralogica Italiana, 15, 2 (2-1992), 67-75 [2a parte]; Cerutti, G., Preite, D. (1995): Mineralien der etruskischen Schlacken von Baratti, Toskana. Lapis, 20, 4, 13-18 and 50. Yamada et al (2001) Koubutsu-Gakkai Kou'en-Youshi, 69. Litvinovich, A. N. & Loginova, M. D. (1960): Elements in small amounts in ores of the Leninogorsk mining field. Trudy Altaisk. Gorno-Met. Nauch.-Issledovatel. Inst., Akad. Nauk Kazakh. S.S.R. (1960), 9, 92-103. Filippov, A. G., & TSIBANOV, V. (2013). Kan-i-Gut Cave Mine in Kyrgyzstan/La Grotta Miniera di Kan-i-Gut in Kyrgyzstan. Mine Caves/Grotte di Miniera. Memorie Instituto Italiano di Speleologia, 79-95. Wilson, W. E. (1980). Famous mineral localities: Los Lamentos, Chihuahua, Mexico. Mineralogical Record, 11, 277-286. Wendell W. (2004) - Famous Mineral Localities: San Pedro Corralitos. Mineralogical Record 35(6), 4-17,65. Dill, H. G., Weber, B., & Botz, R. (2013). Metalliferous duricrusts. Neues Jahrbuch für Mineralogie-Abhandlungen: Journal of Mineralogy and Geochemistry, 190(2), 123-195. Amstutz, G. C.; Ward, H. J. (1956): Geology and mineralization of the lead deposits of Matagente, Cerro de Pasco. Boletin de la Sociedad Geologica del Peru 30, 13-31.
ⓘ La Estrella mine ? Abella i Creus, Joan (2018) Plumboagardite, green anglesite and other minerals from the Alforja mine, Alforja, Tarragona, Catalunya. Mineral Up, 2018/2. Stalder, H. A., Wagner, A., Graeser, S. and Stuker, P. (1998): "Mineralienlexikon der Schweiz", Wepf (Basel), p. 306. [Golley & Williams, 1995, 48 - "Cornish Mineral Reference Manual"]; Kloprogge, J. T., & Wood, B. J. (2017). X-ray Photoelectron spectroscopic and Raman spectroscopic study of bayldonite from Wheal Carpenter, Cornwall, UK. Vacuum, 141, 49-56.
ⓘ Penberthy Croft Mine ? Kingsbury, A.W.G. , Hartley, J. (1960) Carminite and beudantite from the northern part of the Lake District and from Cornwall. Mineralogical Magazine, 32(249), 423-432 (referring to Kingsbury 1954). Golley, P., Williams, R. (1995) Cornish Mineral Reference Manual. Endsleigh Publications, Truro, Cornwall. ⓘ Driggith Mine (Driggeth Mine) ? Kingsbury, A.W.G. and Hartley, J. (1957) Beaverite from the Lake District. Mineralogical Magazine, 31(239), 700-702.; Hartley, J. (1984) A list of minerals associated with the ore deposits of the Caldbeck Fells, Cumbria. Transactions of the Leeds Geological Association, 10(3), 22-39.; Cooper, M.P. and Stanley, C.J. (1990) Minerals of the English Lake District: Caldbeck Fells. Natural History Museum Publications, London, 160 pp. (referring to Kingsbury & Hartley, 1957 and Hartley, 1984). ⓘ Nether Row Brow ? Kingsbury, A.W.G. and Hartley, J. (1957) Beaverite from the Lake District. Mineralogical Magazine, 31(239), 700-702.; Kingsbury, A.W.G. and Hartley, J. (1960) Carminite and beudantite from the northern part of the Lake District and from Cornwall. Mineralogical Magazine, 32(249), 423-432.; Hartley, J. (1984) A list of minerals associated with the ore deposits of the Caldbeck Fells, Cumbria. Transactions of the Leeds Geological Association, 10(3), 22-39.; Cooper, M.P. and Stanley, C.J. (1990) Minerals of the English Lake District: Caldbeck Fells. Natural History Museum Publications, London, 160 pp. (referring to Kingsbury & Hartley, 1957-1960 and Hartley, 1984). Kingsbury, A.W.G. and Hartley, J. (1960) Carminite and beudantite from the northern part of the Lake District and from Cornwall. Mineralogical Magazine, 32(249), 423-432.; Cooper, M.P. and Stanley, C.J. (1990) Minerals of the English Lake District: Caldbeck Fells. Natural History Museum Publications, London, 160 pp. (referring to Kingsbury & Hartley, 1960). ; Green, D.I., Bridges, T.F., Rumsey, M.S., Leppington, C.M., and Tindle, A.G. (2008) A review of the mineralogy of the Roughton Gill Mines, Caldbeck Fells, Cumbria: Part 2 The Roughton Gill South Vein on Balliway Rigg. Journal of The Russell Society, 11, 3-28. Kingsbury, A.W.G. and Hartley, J. (1960) Carminite and beudantite from the northern part of the Lake District and from Cornwall. Mineralogical Magazine, 32(249), 423-432.; Hartley, J. (1984) A list of minerals associated with the ore deposits of the Caldbeck Fells, Cumbria. Transactions of the Leeds Geological Association, 10(3), 22-39.; Cooper, M.P. and Stanley, C.J. (1990) Minerals of the English Lake District: Caldbeck Fells. Natural History Museum Publications, London, 160 pp. (referring to Kingsbury & Hartley, 1960 and Hartley, 1984). Bridges, T.F., Green, D., Rumsey, M.S., and Leppington, C.M. (2011) A review of the mineralisation of the Roughton Gill mines, Caldbeck Fells, Cumbria: Part 3 Roughton Gill Mine. Journal of the Russell Society, 14, 3-23. Young, B. (1987) Glossary of the minerals of the Lake District and adjoining areas. British Geological Survey, Newcastle upon Tyne, 104 pp. ; Cooper, M.P. and Stanley, C.J. (1990) Minerals of the English Lake District: Caldbeck Fells. Natural History Museum Publications, London, 160 pp. (referring to Young, 1987). ⓘ Saddleback upper trial ? MRDS database Dep. ID file #10039392, MRDS ID #M050019. Anthony, J.W., et al (1995), Mineralogy of Arizona, 3rd.ed. : 332; Graeme, R. (1993), Bisbee revisited, Min.Rec. : 24: 421-436. Anthony, J.W., et al (1995), Mineralogy of Arizona, 3rd.ed. : 332. Anthony, J.W., et al (1995), Mineralogy of Arizona, 3rd.ed. : 331. Anthony, J.W., et al (1995), Mineralogy of Arizona, 3rd.ed. : 332; Butler, B.S., et al (1938b), Geology and ore deposits of the Tombstone district, AZ, AZ Bur. Mines Bull. 143. Anthony, J.W., et al (1995), Mineralogy of Arizona, 3rd.ed. : 332; Keith, S.B. (1972), Mineralogy and paragenesis of the 79 mine lead-zinc-copper deposit, Min.Rec. : 3: 247-264. Eastlick, J.T., 1968, Geology of the Christmas mine and vicinity, Banner mining district, Arizona, in Ridge, J.D., ed., Ore Deposits of the United States, 1933?1967: American Institute of Mining, Metallurgical, and Petroleum Engineers, Inc., p. 1191-1210. Anthony, J.W., et al (1995), Mineralogy of Arizona, 3rd.ed. : 332; Simons, F.S. (1964), Geology of the Klondyke quadrangle, Graham and Pinal Cos., AZ, USGS PP 461. MRDS database Dep. ID #10039488, MRDS ID #M050156. Anthony, J.W., et al (1995), Mineralogy of Arizona, 3rd.ed. : 233, 332; Thomas, B.E. (1949), Ore deposits of the Wallapai district, AZ, Econ.Geol. : 44:663-705. Garrett, S.K. (1938), AZ Bur. of Mines Bull. 145: 117-119; Galbraith, F.W. & Brennan (1959), Minerals of AZ: 65. Anthony, J.W., et al (1995), Mineralogy of Arizona, 3rd.ed. : 332; Wilson, E.D., et al (1951), Arizona zinc and lead deposits, part II, AZ Bur. Mines Bull. 158: 55; Galbraith, F.W. & D.J. Brennan (1959), Minerals of AZ: 65. Keith, Stanton B. (1974), AZ Bur. of Geol. & Min. Technology, Geol. Survey Br. Bull. 189, Index of Mining Properties in Pima County, AZ: 117 (Table 4); Schrader (1915): 149; Arizona Bureau of Mines file data. Keith, Stanton B. (1974), AZ Bur. of Geol. & Min. Technology, Geol. Survey Br. Bull. 189, Index of Mining Properties in Pima County, AZ: 137 (Table 4); Ransome (1922): 422-423; Wilson, E.D. (1950): 46-47; Arizona Bureau of Mines file data. Galbraith, F.W. (1947), Minerals of Arizona, AZ Bur. Mines Bull. 153: 332. Kelley, Vincent Cooper (1938), Geology and ore deposits of the Darwin silver-lead mining district, Inyo County, California: California Division Mines Report 34: 545; Mueller, W.H.T. (1974) The mineralogy, geology and paragenesis of the 1208 oxide stope, Defiance workings, Darwin mine, Darwin, California. Unpublished Master’s thesis, University of California, Riverside: 47; Pemberton, H. Earl (1983), Minerals of California; Van Nostrand Reinholt Press: 302, 545; Stolburg, C.S. (1984): The mines and minerals of Darwin, Californa. Mineralogical Record 15(1): 5-18. Pemberton, H. Earl (1983), Minerals of California; Van Nostrand Reinholt Press: 302. Adams, Paul (2010) The Brown Monster and Reward Mines Inyo County, California. Mineralogical Record 41:175-193.; Adams, Paul (2010) The Brown Monster and Reward Mines Inyo County, California. Mineralogical Record 41:175-193. Troxel, Bennie Wyatt & P.K. Morton (1962), Mines and mineral resources of Kern County, California: California Division Mines & Geology County Report No. 1, 370 pp. : 103-104; Murdoch, Joseph & Robert W. Webb (1966), Minerals of California, Centennial Volume (1866-1966): California Division Mines & Geology Bulletin 189: 292; Pemberton, H. Earl (1983), Minerals of California; Van Nostrand Reinholt Press: 302. Pemberton, H. Earl (1983), Minerals of California; Van Nostrand Reinholt Press: 302-303. Saul, R.B., Evans, J.R., and Gray, C.H. (1970) Mines and mineral resources of Riverside County. California Division of Mines and Geology County Report 9. Unpublished manuscript: 814-816; Pemberton, H. Earl (1983), Minerals of California; Van Nostrand Reinholt Press: 303. Hewett, Donnel Foster (1956) Geology and mineral resources of the Ivanpah quadrangle, California and Nevada, USGS Professional Paper 275, 172 pp. : 145; Pemberton, H. Earl (1983), Minerals of California; Van Nostrand Reinholt Press: 302, 303. Hewett, Donnel Foster (1956) Geology and mineral resources of the Ivanpah quadrangle, California and Nevada, USGS Professional Paper 275, 172 pp. ; Pemberton, H. Earl (1983), Minerals of California; Van Nostrand Reinholt Press: 303. Joe Marty, Anthony Kampf, Robert Housley, Stuart Mills, Stefan Weiss (2010) Seltene neue Tellurmineralien aus Kalifornien, Utah, Arizona und New Mexico (USA). Lapis, 35, #12, 42-51. Dr. Housley, R., 2018, pers. comm. Stuart E., 2016, pers. coll. Rocks & Min., March 1998. Myers, W. Bradley (1952) Geology and mineral deposits of the northwest quarter of Willis quadrangle and adjacent Browns Lake area, Beaverhead County, Montana. USGS Open File Report 52-105. Ref: Montana Bureau of Mines and Gology Special Publication 75, 1977; U.S. Geological Survey, 2005, Mineral Resources Data System: U.S. Geological Survey, Reston, Virginia. ; Myers, W. Bradley (1952) Geology and mineral deposits of the northwest quarter of Willis quadrangle and adjacent Browns Lake area, Beaverhead County, Montana. USGS Open File Report 52-105. [Hewett, D (1931) Geology and Ore Depositsof the Goodsprings Quadrangle, Nevada; USGS PP 162]; U.S. Geological Survey (2005) Mineral Resources Data System: U.S. Geological Survey, Reston, Virginia. Palache, C., Berman, H., & Frondel, C. (1951), The System of Mineralogy of James Dwight Dana and Edward Salisbury Dana, Yale University 1837-1892, Volume II: 568, 569. Palache, C., Berman, H., & Frondel, C. (1951), The System of Mineralogy of James Dwight Dana and Edward Salisbury Dana, Yale University 1837-1892, Volume II: 570. NBMG Bull 62 Geology and Mineral Deposits of Clark County, Nevada; U.S. Geological Survey (2005) Mineral Resources Data System: U.S. Geological Survey, Reston, Virginia. NBMG Bull 64 Geology and Mineral Resources of Eureka County, Nevada; Peter G. Vikre (1998) Intrusion-related, polymetallic carbonate replacement deposits in the Eureka district, Eureka County, Nevada. Nevada Bureau of Mines and Geology Bulletin 110; U.S. Geological Survey (2005) Mineral Resources Data System: U.S. Geological Survey, Reston, Virginia. ⓘ Bristol Silver Mines Inc.
Bob Werner (2009) Mineral News, 25, #11, 1-5. Westgate, L. G.; Knopf, Adolph (1932) Geology and ore deposits of the Pioche district, Nevada. USGS Professional Paper No. 171 79 p.
Hillebrand and Penfield (1902) American Journal of Science, ser. 4: 14: 213; Palache, C., Berman, H., & Frondel, C. (1951), The System of Mineralogy of James Dwight Dana and Edward Salisbury Dana, Yale University 1837-1892, Volume II: 569. Min Rec 20:1 pp13-24; GF Loughlin (1942) Geology and ore deposits of the Magdalena mining district, New Mexico. USGS Professional Paper 200.; U.S. Geological Survey (2005) Mineral Resources Data System: U.S. Geological Survey, Reston, Virginia. GF Loughlin (1942) Geology and ore deposits of the Magdalena mining district, New Mexico. USGS Professional Paper 200. Ref. : "Zinc and Lead Occurances in Pennsylvania", R. C. Smith, II, Mineral Resources Report No. 72, 1977, Pennsylvania Geological Survey. UGMS Bull 117 Minerals and Mineral Localities of Utah; Butler, B. S. (1913) Geology and ore deposits of the San Francisco and adjacent districts, Utah. USGS Professional Paper 80. Butler, B. S. (1913) Geology and ore deposits of the San Francisco and adjacent districts, Utah. USGS Professional Paper 80. USGS Prof Paper 1024; Kingsbury, A.W.G. and Hartley, J. (1960) Carminite and beudantite from the northern part of the Lake District and from Cornwall. Mineralogical Magazine, vol. 32, n° 249, 423-432. UGMS Bull 117 Minerals and Mineral Localities of Utah; Bernstein, L.R. (1986) Geology and mineralogy of the Apex germanium-gallium mine, Washington County, Utah. USGS Bulletin 1577. Mondillo, N., Boni, M., Balassone, G., Joachimski, M., & Mormone, A. (2014). The Jabali nonsulfide Zn–Pb–Ag deposit, western Yemen. Ore Geology Reviews, 61, 248-267.